Ulysse Nardin’s San Marco minute repeater, introduced in the late 1980s, was a bold rebuke to the so-called “quartz crisis,” which at the time seemed to herald the obsolescence of the complicated mechanical wristwatch. This year, in advance of this spring’s Baselworld watch fair, Ulysse Nardin again struts its stuff as a producer of ornately designed chiming watches with the release of the new Carnival of Venice. Like the San Marco, the Minute Repeater Carnival of Venice takes its inspiration from Italy’s legendary “City of Canals.” It also uses minuscule automatons, called “Jaquemarts,” which are set into the dial and move in sync with the chiming of the activated minute repeater. On this watch, the Jaquemarts are two masked figures in the dial’s center (masks are a longstanding tradition of the Carnival of Venice, the historic festival from which the watch derives its name), who lift their masks as the repeater chimes the hours, quarters, and minutes. The movement powering this musical masquerade ball is Ulysse Nardin’s manual-wind Caliber UN-71, with a 48-hour power reserve. However, the dial is eye-catching even when the Jaquemarts are still and the chimes are silent. 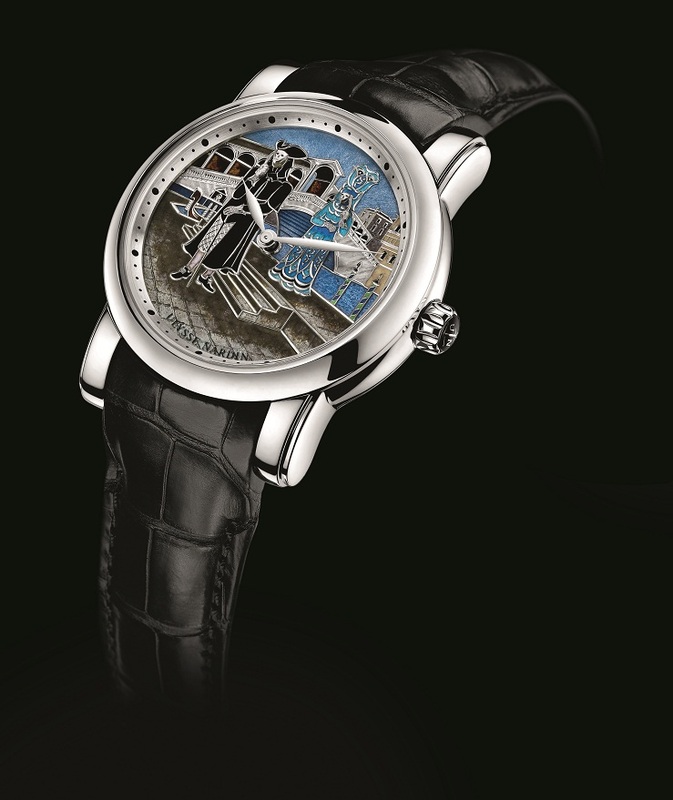 Already well-known for its use of cloisonné enamel on pieces such as last year’s Santa Maria limited edition, Ulysse Nardin opted to use for this piece a dial in champlevé enamel — a decorative technique practiced by only a very few artisans today — and to further refine it with hand-chiseling and ornamental engraving. Only 18 pieces of the Minute Repeater Carnival of Venice will be made; the 42-mm case is made of platinum, though Ulysse Nardin is also offering the option of 18k rose gold.